Years ago, a fisheries biologist told me that once brown trout reach 16 or 17 inches long, their primary forage is baitfish. Baitfish are any fish that they can swallow, whether it is a sculpin or a juvenile brown trout. That’s not to say baitfish is all they eat; they will eat nymphs and occasionally adult aquatic insects on the surface-most notably large insects such as green drakes and salmonflies-but their primary focus is baitfish. Once other species of trout become large, they will also focus on baitfish. Large fish need more nutrition than small fish and want to get the most food for energy expended. Sometimes fish of all species will try to eat a fish larger than they can swallow, and choke to death on a fish that gets stuck in their throat. I have seen a dead pike with a big bass tail sticking out of its mouth; I have seen a dead 4-pound bass with a 2-pound bass half sticking out of its mouth. I caught a nice brown with a 6-inch chub lodged in its throat. Why he ate my nymph is a mystery. At any rate, I am sure his life was spared when I extracted the chub and released him. The bottom line is: big fish like a substantial meal. The reason some fly fishermen like to spend a lot of time streamer fishing is that, on the average, they are going to catch larger fish than nymph or dry-fly fishermen. I created the Slumpbuster to look like a baitfish. Some streamer patterns have lots of glitz, flash, rubber legs, and materials that don’t look natural, but do produce reaction strikes. A reaction strike is when a fly comes ripping past a fish and they can’t help but take a snap at it for whatever reason, but surely not because it looks like anything they have been eating. When wet, the Slumpbuster has the perfect baitfish profile. It has subtle flash and looks alive in the water. In 2000, Joe Schmuecker from Wapsi sent me some Zonker-cut pine squirrel skins dyed in a variety of colors as well as natural. I always get excited when I see a new material that is different from anything out there. Zonker strips have been around forever, but they have always come from rabbit, which has limitations due to its long hair. I started to envision patterns using the short-haired, nicely mottled pine squirrel strips. I tied a variety of prototypes, and finally ended up with one I really liked. Lots of cool-looking patterns don’t necessarily fish well, so I had to test mine onstream to see if the trout liked it. After one season, I knew it was a winner. It just flat-out caught fish. When wet, it has the perfect baitfish profile. It has subtle flash and looks alive in the water. Tricked-up streamers can often get follows or flashes, but fish don’t eat them. When a pattern has lots of flash, rubber legs, and gaudy colors, trout, especially pressured fish, may show interest but can sense that something is not quite right. Trout routinely try to actually eat the Slumpbuster. I fish the pattern year-round, but the best times are spring through fall. I fish at any time of the day whether it is sunny or cloudy, but the best time to fish for browns is early or late in the day. I like to fish two Slumpbusters at the same time. I use 0X fluorocarbon tippet for both flies, with the second fly tied off the bend of the first fly on about 18 inches of tippet. The setup that I have the most confidence in is a size 4 natural color trailed by an olive, black, or rust in size 6. Sometimes I fish a size 6 trailed by a size 8 or 10 if the trout want a smaller pattern. Let the trout tell you what size they want. Wow! Great fly and great information. Thanks for sharing. thanks for great article, I tie a leech pattern my fishing pal uses with great success on Big Lake and nearby springs in Fall River Valley in No. Calif, he calls it trout candy. It is 100% squirrel zonker. I own John Barr’s, Barr Flies. It is a GREAT book!! All the patterns are spelled out just like this excerpt on his Slumpbuster. All the photos, descriptions, and instructions are awesome. I highly recommend this book to all those that love to tie flies… and those that just love to fly fish. The Slumpbuster is the new standard which all others will be judged against!! I’ve been tying a very similar pattern for about 10 years. I call mine a Pzonker. I also weight mine with lead wire and tie them with rabbit. I add flash under a long tail and have a stinger hook to prevent too many shory strikes. It has been a great fly. Great looking fly. I’ll be looking for those squirrel zonker strips, so i can try your pattern in the Bow River. It’s a very effective pattern and more durable then the Zonker. The similar version I’ve been fishing since the late 70’s I call the Bunny Matuka. I also frequently use stripped squirrel, muskrat or mink now instead of rabbit, especially in smaller sizes. I went to it because the Aztec and the original Matuka didn’t have enough natural action for me. Pearl dubbing brushed out also works well as a body material. I tied this pattern to fish the Upper Androsocggin River this Fall. Very productive. I added some flash and rubber legs behind the collar, but I’m not sure it was necessary. I’ll be looking for his book. I concur–a great fly. Relatively simple to tie, durable and effective. The only negative is that even with proper tying, the tail may foul. I’m not the most avid streamer fisherman, but when I do fish streamers, this is my first choice (generally either natural or black squirrel–the body and cone colors may vary). 1. Olive magnum rabbit strip tied in as recommended by Mr. Barr. 3. A body of dubbed cream and white rabbit fur and chopped lite-brite. I tie the body using a dubbing loop technique. Starting today I am adding some pink fur in the dubbing blend because some of our Sculpins exhibit pinkish undertones along their belly. 4. I also utilize a black tungsten conehead to supply a little color contrast like a natural Sculpin. My favorite river is your typical roaring western freestoner and the dead drift/high-stick technique is ideal for getting my rig down quickly in the narrow/deep slots and drops-offs where typically the larger cutthroats reside. Thanks John Barr for all your wonderful fly inventions and the Slumpbuster is my favorite big trout fly. This fly, the “Squirrely Tukass”, was originally developed in the early 90’s (’92 or ’93? 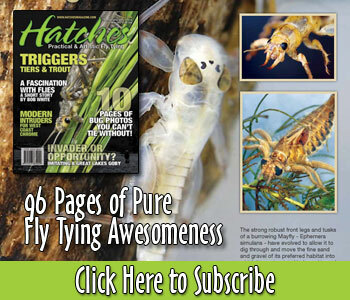 ), by Arkansas fly fishing guide, Jeff Guerin. He tied them both with or without coneheads. He gave me several of the originals, all of which were effective when fishing the White River in Arkansas. » Book Review by Vern-o "Advanced Fly Fishing for Great Lakes Steelhead"